I remember being told by my mother and father as a young boy to never give my name or address to any strangers who called our telephone, and to be even more careful on the computer. They explained that alot of anonymous contacts were actually criminals, looking to rob people who gave them personal information. 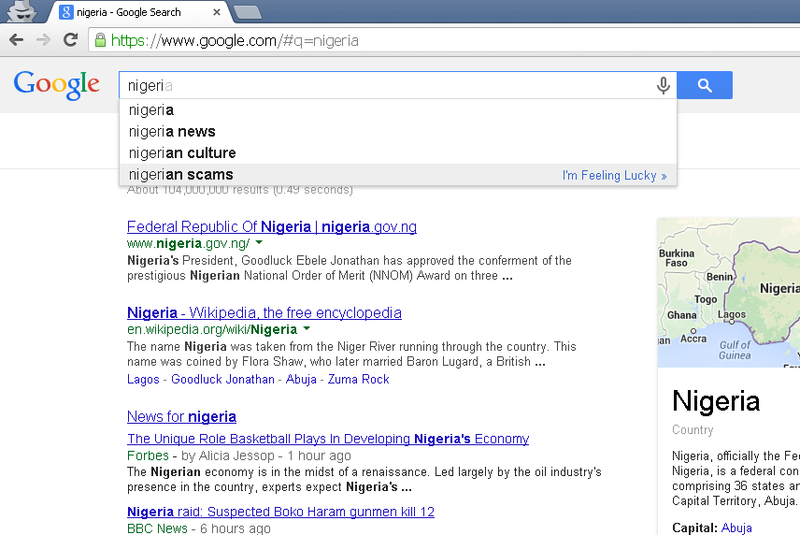 They also explained that, unfortunately, many of these scammers were based in Nigeria, our native country of origin. Throughout the years, that revelation has stuck with me. Like most African immigrants, my parents taught their children to understand the value of education, and imbued us with a strong work ethic. They also taught us the difference between right and wrong; in my house lying was a capital offense. I've always taken pride in the fact that, despite coming from modest means, mine as well as many other Nigerian families have found success in all corners of the Globe, becoming the most educated sub-group in the U.S. for example. With such admirable achievements, the International reputation of Nigerians as internet fraudsters has always seemed to be a thorn flying in the face of what should be a story of progress. Each time I hear about an old retiree being bilked out of their savings, or an uninformed web user seeing their checking account cleared, I feel a special pang of guilt, mixed with embarrassment and anger. On the occasions that I've received questionable emails or social network messages I've found myself lashing out at the invisible crook on the other end, admonishing them for both their blatant criminality and their astounding ignorance in perpetuating damaging stereotypes of our people. The 'earned distrust' of Nigerians around the world compelled the Nigerian Government to make an international statement about the issue in 2010 when it hosted the first West African Cyber-crime Summit, and took major steps to curb fee fraud. So, problem solved right? Well, if you're the typical internet user the answer is a resounding 'NO'. Take the case of U.S. internet users; In 2012, almost 290,000 reports of online fraud were reported to the FBI, averaging more than 24,000 a month, and reported losses rose 8.3 percent over the previous year. The scams have evolved as well, with facebook and twitter friend requests and messages becoming more common. To understand why the trend in scamming has only continued to rise, a deeper analysis of 419 scams is required. An individual or company receives an email from an alleged "official" representing a foreign government or agency. An offer is made to transfer millions of dollars in "over-invoiced contract" funds into your personal bank account. You are encouraged to travel overseas to complete the transaction. You are requested to provide blank company letterhead forms, banking account information, telephone/fax numbers. You receive numerous documents with official-looking stamps, seals and logo testifying to the authenticity of the proposal. Eventually you must provide up-front or advance fees for various taxes, attorney fees, transaction fees, or bribes. Permit me to inform you of my desire of going into business relationship with you. I got your contact from the International web site directory....there is a sum of $12.500.000 left in a suspense account in a local Bank here in Abidjan.Sir, we are honourably seeking your assistance in the following ways. 1) To provide a Bank account where this money would be transferred to. 2) To serve as the guardian of this since I am a girl of 26 years. The 419 process is extremely complex, and the average subject is immediately repelled by tales of West-African riches to be had. But, according to researcher Cormac Herley, this is where the true genius lies. The fact that the vast majority of people are immediately repelled by the fraudulent communications means that only the most promising targets actually proceed through the process and fall victim to the scam. Essentially, only the naive apply. This is the reason why these fraudulent emails are sent out en-masse, scammers must draw from a huge pool of contacts in order to identify the small number of likely victims. The introduction email costs scammers nothing, so they blast those out to everyone. The expense starts when the scammer receives a response and has to begin building a relationship with the potential victim. So to get the best return on their investment, the scammers want only the most naive, gullible people to respond. 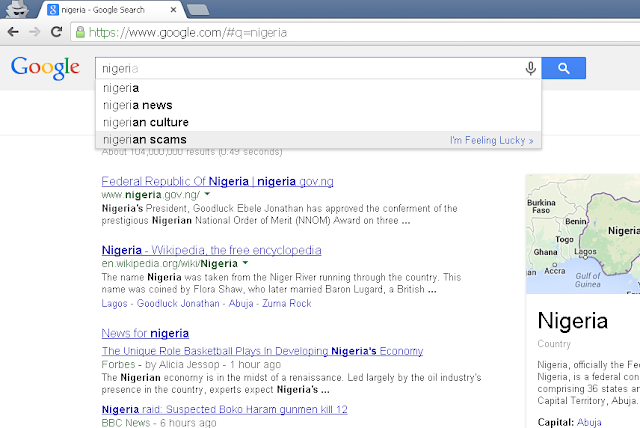 "There are more non-Nigerian scammers claiming [to be] Nigerian than ever reported. Even when Nigerians relocate to other West-African countries they retain Nigerian status, addresses, and operational bases in their e-mails for competitive reasons." "It is Nigeria's dreadful reputation for corruption that makes the strange tales of dodgy lawyers, sudden death, and orphaned fortunes seem plausible in the first place." Where are they really from? Where do these scams actually originate? This question was addressed by a paper in the African Journal of Information Systems by Olumide Longe and Adenike Osofisan, researchers at the University of Ibadan. 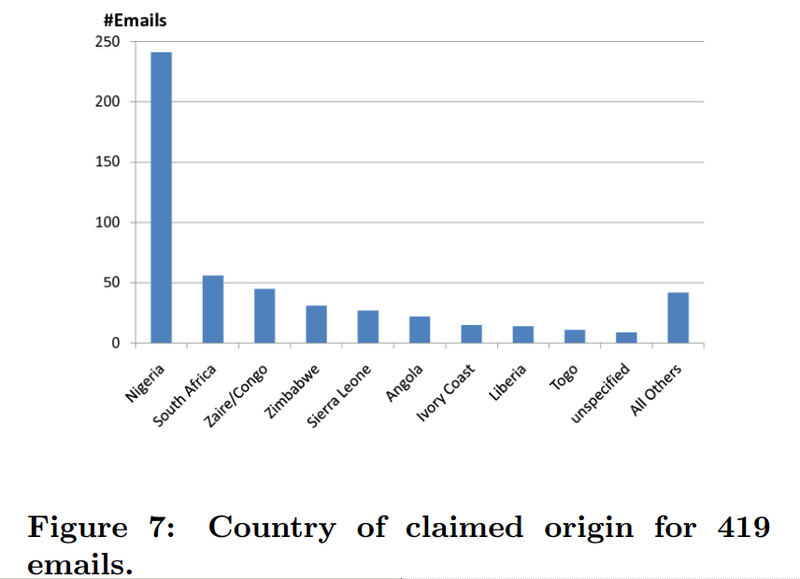 For the paper, the researchers used freeware e-mail and internet protocol address tracers to identify the email origin of 400 scam emails. 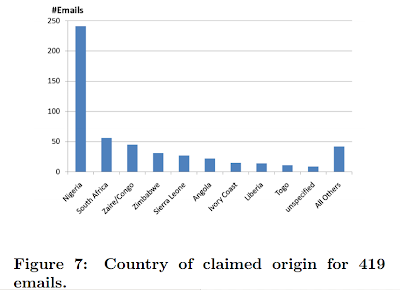 Their results reveal that while countries in Africa do account for around 20 percent of emails, most 419 emails originate from countries in Europe and America. Nigeria's reputation as internet scam artist's home base during the initial wave of scams in the past, coupled with the anonymity of the internet today, has created a vicious cycle. In this cycle the reputation of Nigeria as a nation of corruption has become an institution in itself, relied upon by scammers the world over who need a dependable method of identifying the most vulnerable targets for their schemes. Their continued masquerading as Nigerians has in turn bolstered this reputation, thus perpetuating its existence. So whats the solution, if any? In my opinion, responsibility for the current situation ultimately lies with the criminals who continue to perpetrate Advance Fee Fraud, but the task of repairing Nigeria's image falls to every citizen and emigrant from the Country. The good news is that our culture and values have always been strong, and while our positive accomplishments may not be at the forefront of international perception quite yet, they are numerous. We can put the problems of the past behind us by continuing to strive for success every day. 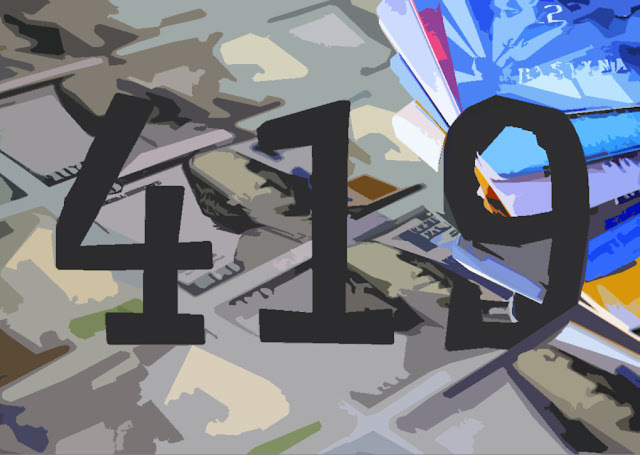 Do you have a 419 email story? Feel free to share a comment.